Review: In the tradition of MTV 2000s staple Jackass, which aired on Van Toffler’s watch, Too Stupid To Die is packed with bizarre pranks and outrageous stunts. Set deep in the heartland of Indiana, it features a group of backyard dare-devils who have nothing but time to kill, and that time is spent thinking of outlandish stunts and pranks. It is a story of have-nots with hearts bigger than brains who are coming to grips with what they do have, an unusual, but resilient friendship. Each half-hour episode has a theme in which the stunts will fall into – Dating, Cars, Unemployment. 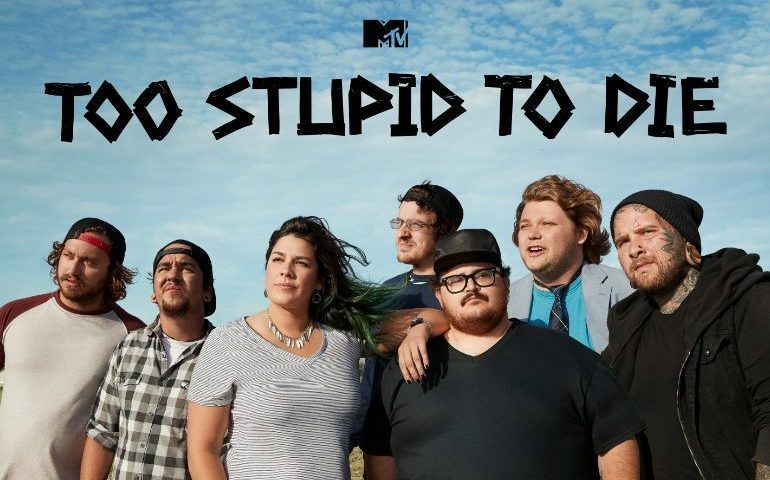 Too Stupid To Die fits into MTV’s current programming strategy that focuses on coming-of-age docu series like Floribama Shore, Siesta Key and the return of a signature MTV show featuring young adults, Jersey Shore. It has helped fuel the network’s ratings growth, with MTV recently closing its third consecutive quarter of increases in its target 18-34 demographic, its best streak in 7 years. Too Stupid To Die features a young Indiana man, Zach Holmes, who, along with his crew, performs and films outrageous stunts and pranks. Holmes was discovered online by Gunpowder & Sky’s David Harris who had joined the company from MTV. Harris and his team went to Indiana and shot a 10-minute tape featuring Holmes perform stunts, interact with his family, including his grandma, and even visit the hospital where he is a regular customer thanks to his unusual hobby. (you can see a compilation of some of Holmes’ hijinks in a video below). Word of the project got out, there was interest and Gunpowder & Sky was in talks with potential buyers when Toffler met with McCarthy and Amy Doyle, General Manager, MTV, VH1 and Logo, to discuss possible collaborations. That’s when Too Stupid To Die came up. “It felt like serendipity that we shot the tape, a couple of weeks after we shot the tape I was with Chris and Amy and Chris instantly said, ‘Wow. This feels right. Let’s go do this together’,” Toffler said. Producing the series for Gunpowder & Sky are Toffler and Floris Bauer, who launched the company in 2016, Harris, Holmes and Ross Breitenbach, alongside MTV’s internal producers Tiffany Williams and Ben Hurvitz On the heels of Too Stupid to Die,Gunpowder & Sky is in talks with MTV on several other projects. Since he took over the helm of MTV in late 2016, McCarthy has rebooted a number of classic series, including Jersey Shore, TRL and My Super Sweet Sixteen. Was there an idea to frame Too Stupid To Die as a new installment of MTV’s Jackass? While Too Stupid To Die was bought by MTV about a year ago, the timing of its launch is fortuitous, coming off of the mega success of ABC’s Roseanne revival, which has underscored the untapped potential of telling stories of working-class Americans from the flyover states, something MTV previously explored with Buckwild, set in rural West Virginia. During the lively — sometimes a little wild — joint interview with Toffler and McCarthy, I asked Toffler about his assessment of MTV under his successor.